The top section of the marker forms a diamond, the symbol of Third Corps. Erected 1889 by State of Maine. Location. 39° 48.749′ N, 77° 14.118′ W. Marker is near Gettysburg, Pennsylvania, in Adams County. Marker is on Hancock Avenue, on the right when traveling north. Touch for map. 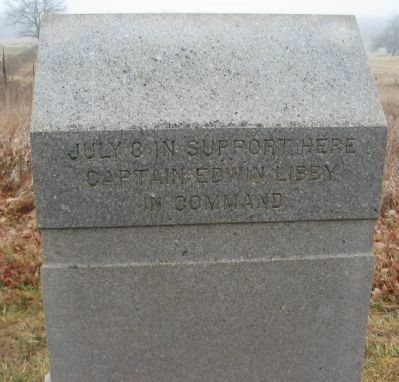 Located opposite the "Copse of Trees" on Cemetery Ridge in Gettysburg National Military Park. Marker is in this post office area: Gettysburg PA 17325, United States of America. Touch for directions. 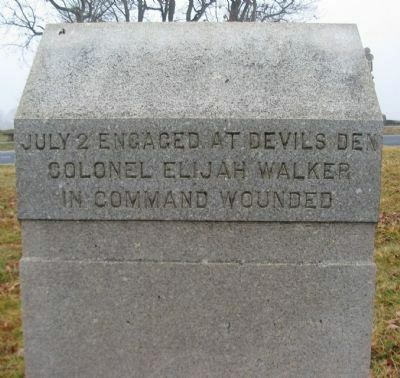 (within shouting distance of this marker); Battlefield Landmarks - South and West (within shouting distance of this marker); Pickett's Charge (within shouting distance of this marker). Touch for a list and map of all markers in Gettysburg. More. 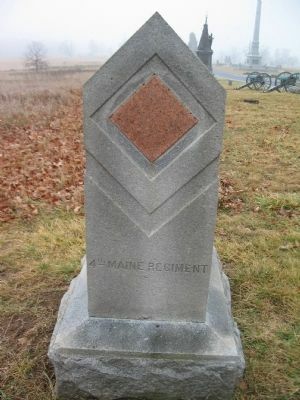 Search the internet for 4th Maine Regiment. Credits. This page was last revised on June 16, 2016. This page originally submitted on February 16, 2009, by Craig Swain of Leesburg, Virginia. This page has been viewed 1,017 times since then and 10 times this year. Photos: 1, 2, 3. submitted on February 16, 2009, by Craig Swain of Leesburg, Virginia.